Ruby is so adorable and your teeny story about her is cute. 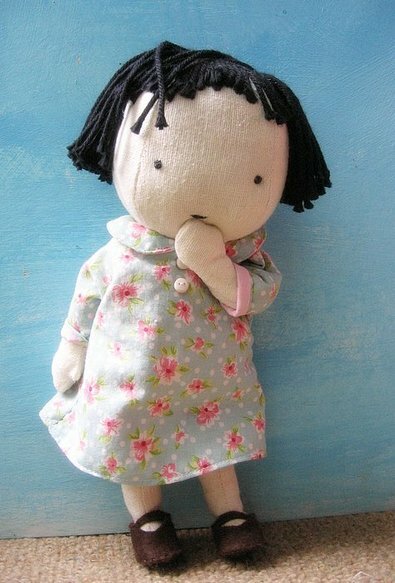 you are a very talented doll maker!, she must be the cutest doll ever! ohhh I LOVE her! She's gorgeous! Every little bit of her! You are so clever! she seems lonely in there, let's play together!!! love ur work so much!!! Holy crap! Ruby is adorable, even with her hair whacked to heck. Only if you where near my countrie. I would ask you to do one for my baby daugther. Oh my god!!!!!!!!!! She is divine!!! When will she be mine???!!!!????? Ruby may be the cutest doll I have ever seen. Truly. ruby may be naughty, but she's awfully cute! How sweet is this??? You continue to outdo yourself, Lyn..
too cute for words! made my morning! Aaack! Aaaack! Aaaack! Ruby is unbelievably cute!! SO cute. Did you design her yourself? And the DRESS? I just can't stand it, the cuteness! Big, big smile here in Japan! You are a very talented person, Molly Chicken, you have a great eye for the little detail which gives something such character. Wonderful!!! I'm so glad to see another one of your projects. Outstanding as usual. Awwww... how could anyone be mad at sweet mischevious Ruby? 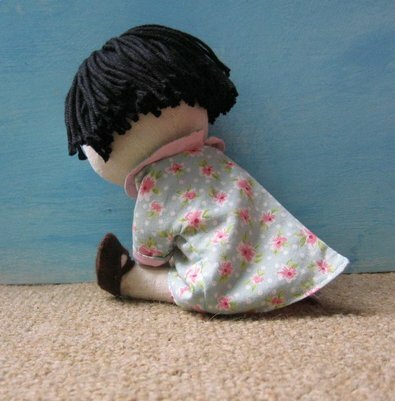 The photo of her from the back is the cutest thing ever! a delightful doll and a delightfull poem. Well done! time to hide them scissors! Oh, heavens! I'm going to be staring at these pictures all weekend long. She is amazing, Lyn, and so are you. Where can I get one of these, seriously. Do you make them for others? My daughter's name is Ruby and I am sure some hair-cutting is in our future. I would love to have one of these dolls. too cute !!! I love her. Linky Love for this post, EARNED. I love it. Kudos, upon kudos, upon kudos. Thank you! I adore her!! She's just perfect. She may be in disgrace but she is also the cutest little girl in the world. I love her! ahhhhhheeeee! that is the most adorable, wonderful, delightful and gosh-darned cute thing ever. i just love it ms. chicken! p.s. silly me posted this on the wrong blog entry. whoopsie! Please post naughty Ruby from the back on flicker so I can *fave* it. Now I know why it's been soooooooo quite around here. I hope Ruby gets out of the doghouse soon--! she's great! so full of expression. i love the little story too. yey! She is completely gorgeous. I love her. oh my, she looks quite contrite:) This is terribly adorable! Oh! You rascal! You've been making Ruby and didn't tell us? Can I have her? I love her. I know just how she feels since I did the same thing when I was three. I love her dress and her shoes and her hair and her face and her shape. *whispers* "Ruby, run away to America and live with me!" AWWWWWW...I love Ruby! What a beautiful doll!! Oh no you di-int. Tooo cute. I am speechless. I just gotta say, I love her too. she is gorgeous! I love her face. Oh Ruby, my hair once looked like yours, but I spent a lot of money at a salon! =) I would say that it will grow back...but, um, I wouldn't count on it. Beyond wonderful....I would gladly pay a lot for a pattern. Is this a possibility? It seems impossible not to have her near somehow. I can't imagine that you would ever part with her. I just want to eat. her. up. You know, you are a woman of few posts. But when you do post, you have the best stuff! Ruby is simply fantastic!! She's superb. Her face, although so simple is so expressive - you are very talented - thanks for sharing her with us. My gosh Lyn, she is freakin fantastic! An all too familiar story too, my son just did the same thing last week! Just too hard to resist. Have to come out of lurkerdom to say that Ruby is just about the cutest thing ever, it's been said before but bears repeating, you make the most beautiful things. so cute so lovely, i love her! Ahhh I love her! I love the way you posed her against the wall and then with her hand on her mouth so mischievous. She looks just like her drawing. How did you learn to make such beautiful things? From books or just trial and error? oh my goodness, now thats CUTE! Ooooh, Ruby, what have you done, you silly girl?! Not that we all haven't done it before. So beautifully stitched, dressed, captioned, and photographed. I have such admiration for you, Lynn. Can not even get over how cute she is. Lyn, you can't keep doing this to us! Listen to us! You're reducing us all (most of us grown women?) to blithering idiots. Ah, but at least we're happy. What a sweetie. Love the animation in that last photo. You always do that so well! Her shoes are to die for, so sweet. My little one cut her hair last spring and then looked in the mirror and got upset because "I don't look like me anymore." She's the sweetest doll I've ever seen! I sure hope you're going to sell the pattern. 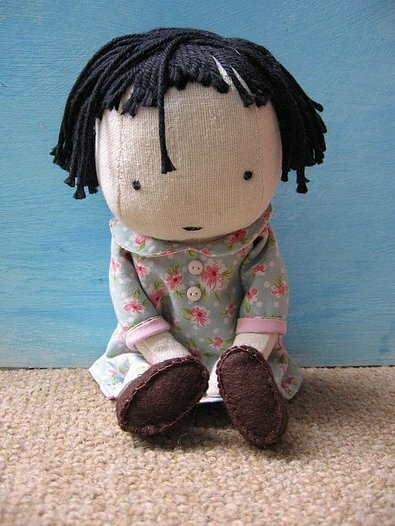 I'd love to make one for my little girl. I can see it's been said many times already, but I must say it too - ADORABLE! How adorable! And you managed to make her so expressive with just two tiny dots and a little touch of a smile. She´s so beautiful! Love her expression, she´s too much! She's soooooooooo adorable!! I just want to hug her!!! Holy crap she's absolutely wonderful! Seriousy Lyn, you are a friggin genious. Ohhh! She's sweety (lovely, adorable, ...)!!!!!! P.S. - Please tell how you do the hair like that! And - the dress, and the shoes... actually, the whole thing. So wonderful!! Love it! My daughter's name is Ruby. She has yet to get her hands on scissors although I've been wanting to trim her hair for months. I.am.jealous! How do you do that? So creative and so talented! I feel like I have two left hands... And I think her new haircut actually looks very stylish. Would also like to know how you did her hair. She's too beautiful for words!! I read your blog for a few months now and I just love it. Bravo Molly ! Oh dear, I love her! What a cutie. I am sitting here chuckling away like a mad woman! 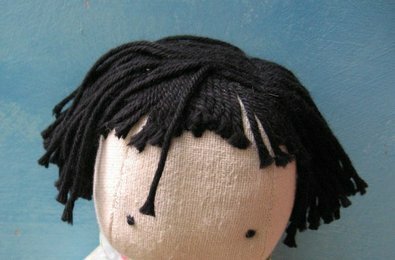 How do you do it, how do you make a doll with such a cheeky little face? I love her to bits!! so flippin' wonderful and full of character! OMG 90 something comments on this doll!!! well she is lovely I know, but I am fairly new to blogland and over 90 comments OMG!!! J'adore, cette poupée est magnifique.